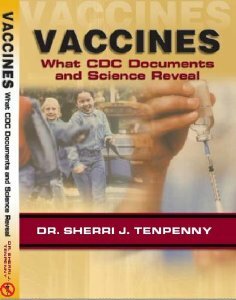 Vaccine-Injury: Dr Sherri Tenpenny MD - Are Vaccines Necessary?Dr Sherri Tenpenny: Are vaccines necessary? Dr. Tenpenny, in her own words: To date, I have logged well over 20,000 hours of personal time researching to expose this 200-year mistake. I have collected more than 5,000 mainstream articles into my subscription website. These articles, and more, lay bare the travesty, greed, conflicts of interest and sordid politics behind vaccination. I look forward the day when parents stop poisoning their children because they blindly follow the advice of an under-informed "authority figure" in a white coat. The day is approaching, through the efforts of many, when adults will be more fearful of what is coming through that needle and the potential consequences of a life time of poor health and medical travesties than they are of a fever, a rash, a cough and diarrhea -- the core symptoms of childhood diseases. The ultimate truth is this: Health is an inside out phenomenon. Take care of your body and it will serve you well. Health simply cannot come thru a syringe filled with chemicals, sold to parents through the false premise of "protection." Thank you. I was drawn into the ever-changing, emotionally charged vaccine debate after attending the National Vaccine Information Center (NVIC) meeting in September 2000. I was troubled by what I had heard and decided to search for answers by going straight to the leading vaccine authority in the country: the Centers for Disease Control (CDC). Imagine my surprise and dismay when I discovered that most of what I had accepted as The Truth about vaccines really was not the truth at all. Vaccines are not responsible for the eradication of diseases, such as polio and smallpox. Vaccines have not been proven to be safe. When a vaccine is called "effective" it is not the same thing as being "protective." There are no true double-blind, placebo-controlled studies used in vaccine research. The new, investigational vaccine is compared against a vaccine with a "known side effect profile." Therefore, "control group"is given a "placebo" that is another vaccine, not saline, sterile water, or no vaccine at all. Vaccines are not "relatively harmless" as thousands have been injured and have died, as a result of vaccination. 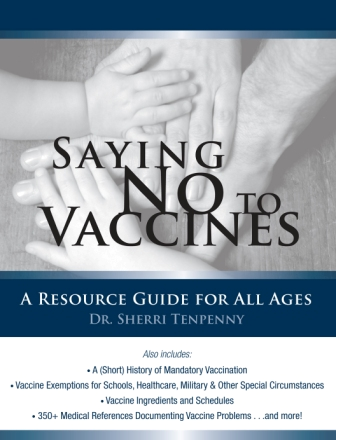 "Dr. Sherri Tenpenny is respected as one of the country's most knowledgeable and outspoken physicians regarding the negative impact vaccines can have on health. In addition to vaccines, Dr Tenpenny is an expert on many topics within the field of Integrative Medicine. She speaks frequently on breast health, women's health, natural approaches to thyroid and adrenal conditions. I oppose the "one-size-fits-all" public health policy imposed by state rules and implemented by physicians regarding childhood vaccination. I oppose a system that forces parents to make decisions based on fear. Any physician who forces a parent to vaccinate through threats; threatening to turn them into Children's services for "medical neglect" or threatening to dismiss them from their medical practice is not the physician you want caring for your family's health. I am opposed to those behaviors. I support the freedom to refuse any medical procedure, including the right to refuse a vaccination, and I am willing to fight to defend that choice. Once people understand the real risk of the viral "vaccine-preventable" infections vs. the risks of vaccines designed to prevent the infections, I believe people should be allowed to make a choice regarding which risk they are willing to accept. I am in favor of true, complete informed consent, which means a person hears the full spectrum of pros and cons regarding a medical option and then is given the choice to refuse this therapy. Our current public health policy does not allow that option. I sincerely believe that vaccines cause more harm to the health of the individual than the "protection" and "benefit" they are proclaimed to provide. Staying healthy without vaccines is not only possible, but being vaccine-free is the only way to maintain a lifetime of real health. I used to say that not vaccinating isn't for everyone. But as pervasive, multi-generational illnesses are becoming the "norm", and parents have somehow adopted the notion that OT, PT, speech therapy and inhalers for asthma are a "normal" part of growing up, I've become much more bold in my insistance that the nonsensical notion that vaccines are "safe, protective and harmless" has got to stop. We've gone from 3 vaccines in 1985 to 16 vaccines in 2012, and many more on the way. We have become a repository of Pharma's widgets; the drugs and vaccines they sell. Avoiding both is the only route to health and wellness. For those who are already chronically ill, know that injecting more foreign matter is not going to do anything to move you back toward health. There are better, safer, more effective ways for avoiding illness than by getting a vaccine. It's time for adults to stop being fearful of the short list of illnesses viewed as "vaccine preventable." We need to stop being phobic about germs and overwhelmed by a bug and fever. If you are fearful of repercussions from family members, friends and neighbors, don't discuss the issue with those you cannot extricate from your life, and find new friends who are supportive of your views. You Don't Want to Know What's in Your Flu Shot! I wanted to write to you because I feel such an oddity in my profession. I am a registered paediatric nurse, yet I am opposed to vaccination and have not vaccinated my children. I am not able to voice any opinion in the workplace as it would attract unbearable dissention but I love my job and carry it out as intended. Thankfully I very rarely have to deal with immunisation or giving it but more and more I find myself looking around at the kids admitted and wondering what ended them up like that. What I've seen makes me know that vaccine injury or potential vaccine injury is not reported in our hospitals and healthcare system. I've seen a baby come in with infantile spasms a very short period after DTP and the doctor told them that it would have happened anyway and that the DTP "brings out" the spasming and no vaccine event recorded. Employees saying they got the flu after the flu shot and refusing to get another who are told that it isn't possible for it to cause the flu and they were getting the flu anyway. So many kids with diabetes, asthma, obesity, allergies, autoimmune, neurological, Kawasaki, guillian barre - I don't believe every single thing is caused by vaccine injury but I believe a good portion of them are. The burden is sometimes great working amongst it.